Well it has been quite a while since my last report in Sakuracon 2017. Well actually that was just a month ago that Sakuracon happened. And now it's the month of May and the beginning of the convention season. The big conventions are happening all over the country and it's the perfect time to attend since mostly everyone is free from school. And it all begins here in the Bay Area in the heart of San Jose. Yes, its that time of year again. 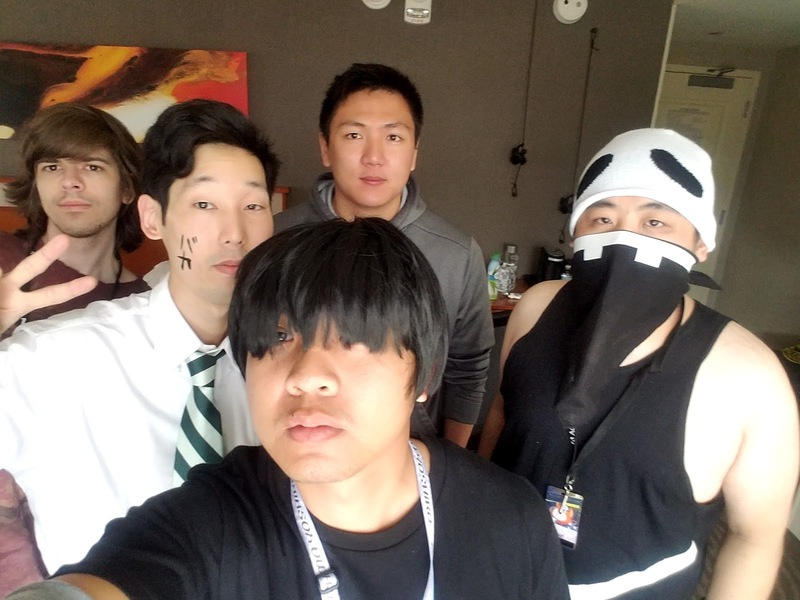 Welcome to Fanimecon 2017! This will be my 8th year in attendance and hoping for another awesome year at my local con! The con would start off as always at registration and this year they have moved registration yet again this year. Where is it this time? Not at the usual place in the new building where the viewing rooms are. Instead it's in the section of the convention center called "The Hub." Many of you are now wondering where that is also. Well remember where registration was many years ago? Yup, back at the same old location in the middle of the con. When I entered the registration area, the line was already backed up from where registration started stretching all the way to the Hilton! The line would run in zig zags all throughout the hallway and even to the staircase of the Hilton 2nd floor and even outside of the convention itself. I'm already thinking it's going to be yet another linecon this time around looking at the length of the line but we'll have to see when registration opens. 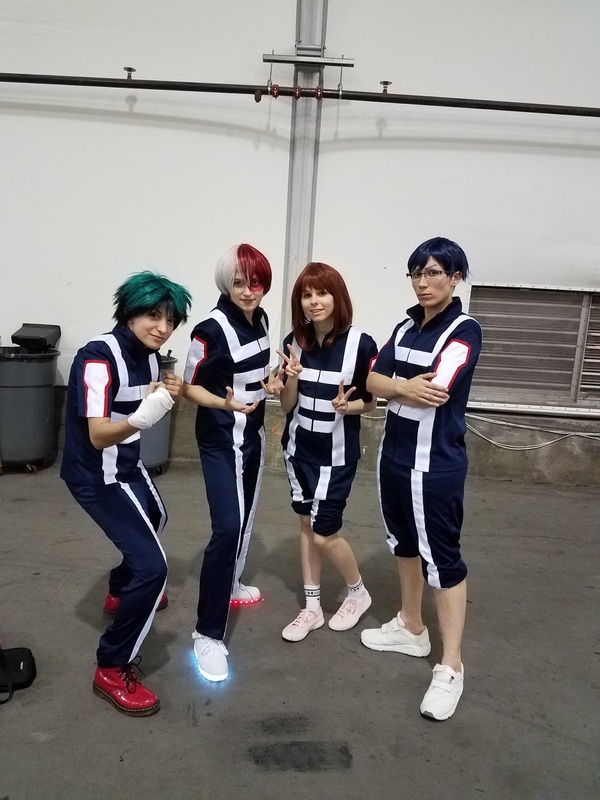 Now I would meet up with my friend and would hop in line with her so that we would go together through registration instead of me just going to the back of the line which was already outside of the convention center. But as registration opened, the line would run through swiftly. It was actually really fast this time around and yet I wonder why. 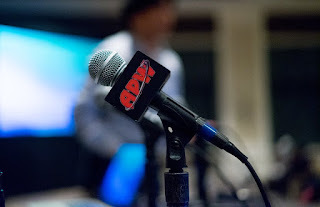 The reason was that they now implemented a system that big conventions like Anime Expo uses. Many computers and scanners were placed on tables all over the registration area and all attendees just go to one of these computers and either scanned the QR code they were given when pre-registering for the con or find their name. They would then print out your badge in the ends of the table and bam! You've got your badge. I would then pick up the goodie bag for Fanime that includes the pamphlet as well as a mini schedule and other goodies. The thing is it went by fast, like 5 minutes from where we were in line! From last year's disaster to now, registration improved significantly! Well now that we got our badges, it's time for me and my roommates for the con to settle into our hotel room. We would get the Marriott again and this time in a lower floor (6th floor). I find this to be a convenient spot just in case the elevators get too crowded and that we can just go down a couple of floors to the 2nd floor where the con is located. So once we got into our room, we settled in and rested a bit. Later on tonight, I would be using this badge to get into Swap Meet. This will actually be my first year selling at Swap Meet at Fanime and from what I've experienced during the times I've done swap meet at Sacanime, I would really gain a lot of money from selling my stuff at the swap meet. So when I got the green light to sell at Fanime, I wanted to see how I'd do at this con. What's up brotha?!? The Aldini Brothers about to cook up something goooood! I would later find out the time was almost 7:30pm and Fanime's swap meet was about to begin and that's my departure from the group for now. I'll eventually meet up with them again during Swap Meet. But for now, I had to head back and meet up with Nikumi and our time at Swap Meet was about to begin. Although I had to make a pit stop back to my car where I parked to get all my stuff. There was a lot of things I was selling during this Swap Meet that included my old Anime DVDs, plushies, figures, video games, apparel, and other anime things. It was so much to bring that I couldn't even bring over all my posters. I guess I'll bring it to another con's swap meet to sell. 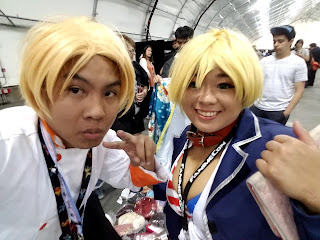 When me and Nikumi arrived, we would be at the seller's line which was located on the other side of where all the attendees were lining up in South Hall, just behind the San Jose Convention Center. And the attendees line was stretching all the way to the halfway point of South Hall and then back again to Market St. where the entrance was. The line was pretty much half the length of the convention center! When it was our turn to register, everybody would be inside South Hall already shopping to swap meet vendors that were already established on the Swap Meet floor. We would have a spot, but since we came in pretty late, we would get what was available in the back of the Swap Meet. Once we set up shop, me and Nikumi as well as another friend of ours started selling. Each of us would have certain things to sell: Nikumi had cosplays while our friend had trading cards to sell or trade. For me, it was just random stuff that would still be valuable for anime fans out there. Many attendees saw our area and already were asking questions about pricing on stuff while we try our best to make sales and answer questions that come to us. The first hour was pretty much crazy, almost all of the attendees that picked up their badges on this day were there to find good deals. Once one attendee finds something good, more would come and see the stock we have. This would last for pretty much 4 hours (Swap Meet was up till 12 midnight that night), but we ended up having a fun time even though it was pretty hectic. The earnings we got would pay off anyways. The NikuTakumi Swap Meet store is open for business! 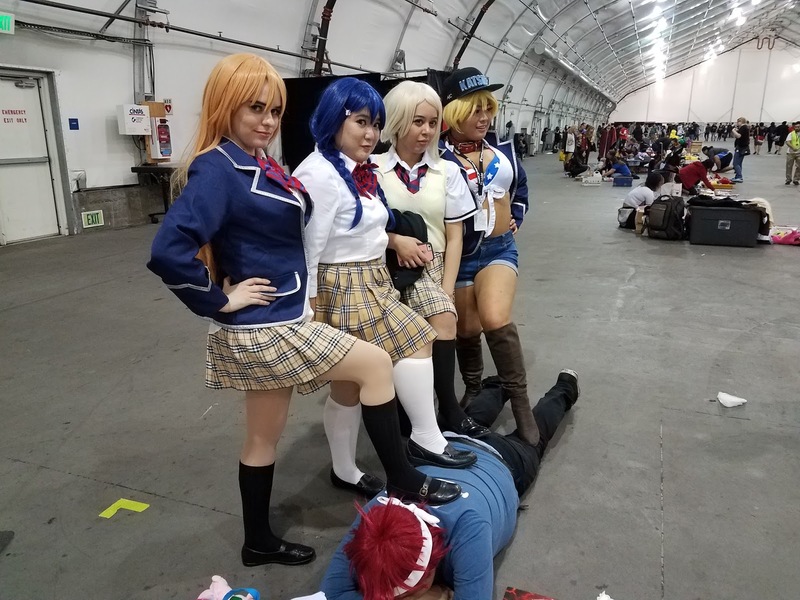 Poor Soma getting shown up by the ladies. At midnight, I would pack up the remaining stuff back to my car and then hanged out around the convention center and visited a couple of my friend's hotel rooms until I was ready to crash for the night. As always, the only thing open that was open on Day 0 was the Gaming Room so I would go there and play some games. But overall, the pre-game was done. I was able to gain money that would actually help pay for con thanks to the Swap Meet. There was just so many people attending this Swap meet, it was overwhelming! The real con begins tomorrow with day 1! We're already hype for this con, we can't wait for the festivities to begin. 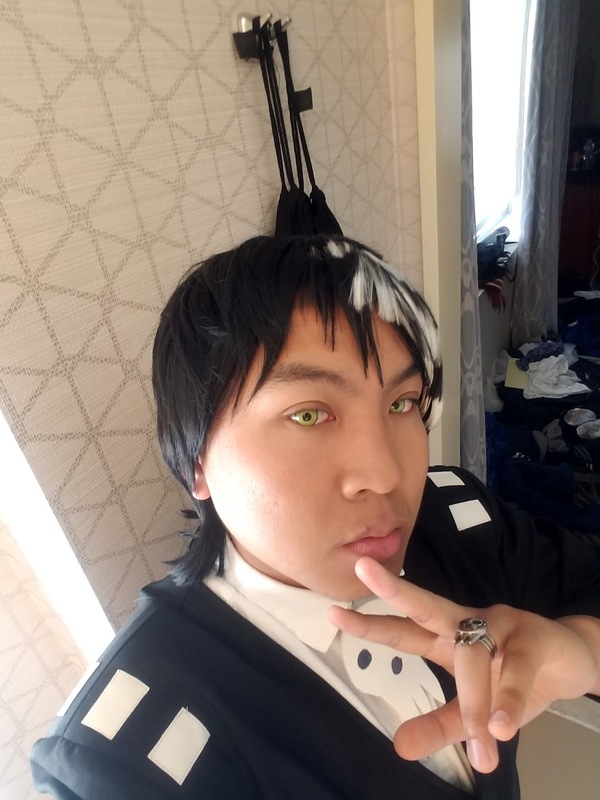 After a late night last night, I would wake up around 9am to meet up with a friend of mine who would give me his wig that would help me out in my cosplay for the day. At the same time, I would pick up my Press badge in the press room since they open around the same time. I would arrive back at my room with my roommates already up and ready for the day. 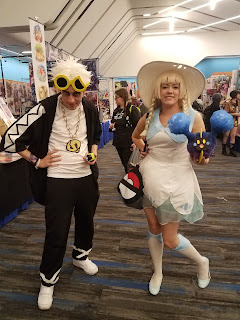 I would take a quick shower and would dress up in my cosplay: I would cosplay Blue/Gary from Pokemon Sun and Moon along with my friend who is cosplaying the counterpart Red/Ash. We would have actually cosplayed Yuri on Ice! 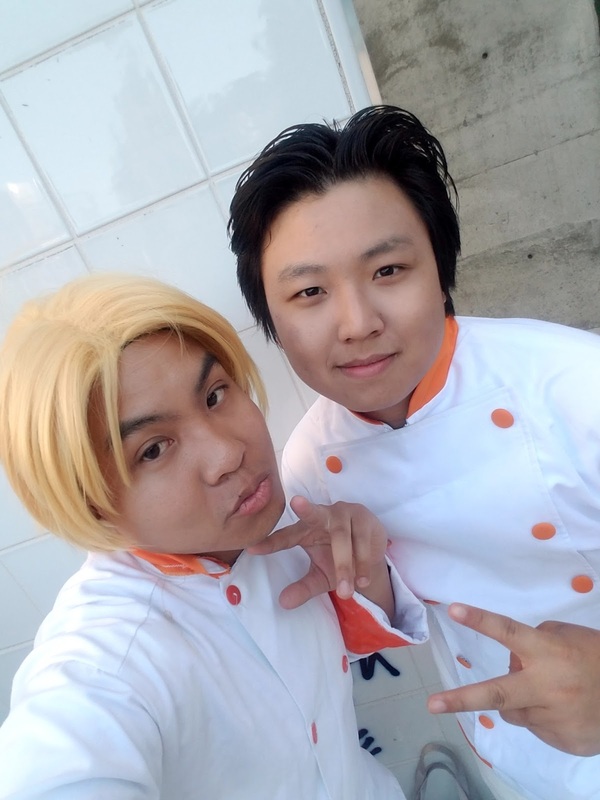 as Yuri and Viktor (that OTP that pretty much made that show) but Victor's outfit was too small for my friend so we decided to axe the cosplay off our lists. We'll hopefully bring it back at another con later on. This day was pretty much a chill day for both of us, we really didn't have much planned going on this day when it comes to panels to visit, autographs to get, or events to attend to. 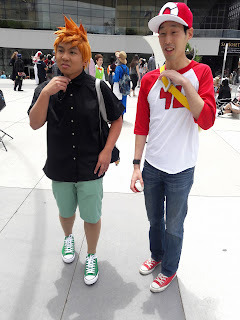 We pretty much wanted to see how the con is overall in the beginning day of Fanime since everything opens up today. But since they don't open until later on in the afternoon, Me and my Ash along with a couple of friends would go out and grab some pho in a #HypeForFanime hotspot called Pho 69. When we entered, the place was mostly empty! Did no one know about this pho place? Anyways we would easily get seated, grab our bowls of pho and would get a good satisfying meal to start off the first day of Fanime. Once we were done with our lunch, we would go to what used to be Quickly that was down the Paseo de San Antonio at the end where SJSU was at. What replaced this place? Something better actually, another boba place called Gon Cha. For some who don't know, Gon Cha has many stores around the South Bay area and I really didn't know that they built one close to Fanime. And to me, Gon Cha's boba drinks have always been a hit to more more than it's previous Boba place that took the same spot (Quickly). The only setback is that they were only selling drinks, nothing about food from when I was there. So I would just grab a Pearl Milk Tea with Boba and then walked back to con. It would be a satisfying drink to have since it was getting a little bit warmer during the day. 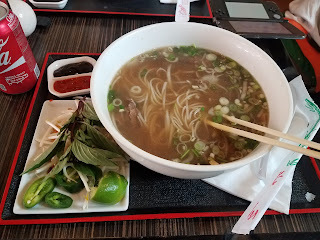 The first meal of Fanime 2017: Pho from Pho 69, a great place to eat! When we arrived back to con, it was about time that Dealer's Hall and Artist's Alley would open for the con.We would go to dealer's first and then browse around the dealer's hall area to see all the sellers that were around this time at Fanime. What I would notice was that it's was kind of the same layout where some of the main stores would be around in the back, especially big name stores like Bandai, Bluefin, Kinokuniya, and Cosplay in America? 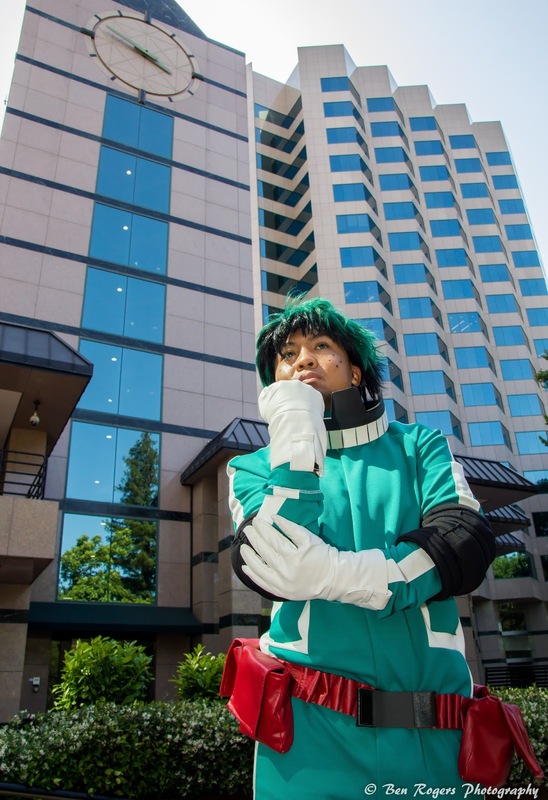 Ejen, the man behind the book Cosplay in America, would be there to sell his new Vol. 2 Book in one of the Booths in the back which me and my friend would meet up with and have a little chat with him about conventions life and what brought him to Fanime. He would explain that he has been in attendance to this con before and he says this con has a different feel than other cons he visited. 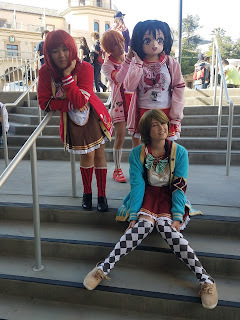 It may have been the fact of the motto of Fanime, By Fans For Fans. This con is pretty much a fan made con, not really supported by big name industries. That's why when you seen the booklet every year, you don't get to see the companies that help Fanime like Crunchyroll and Funimation for example. It's all been made by the fans and it has always been running every year. 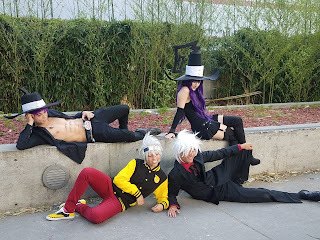 Ejen appreciates the whole fact of a fan con and that it's just mostly a chill con from what we think Fanime was. We would continue talking more about the cosplay community, conventions to visit, and other things. It was actually fun to talk to Mr. Cosplay in America. As I continue to see the layout of the con, I saw the local stores in the front like ToysLogic and Hobbyfan that have their warehouses in the Bay Area. The well known stores that always goes to California cons like Level Up Studios, Sanshee, Anime Books, ABCToy4Me, and Jungle are mostly in the back on the conventions. And what I like now is that each row is now named for everyone's convenience to find the specific store to visit. What's funny though is that they named each column after Japanese foods. So you would see Toyslogic in the row Ramen on the left. While Kinokuniya will be at the end of row Takoyaki on the left. It's fun how to tell how people where stores are now. Some Dealer's were actually artists and some were promoting other cons like Sacanime had their own table to promote their con coming up in Labor Day weekend. Overall, I don't really see much of a difference in the layout or the stores that visited Dealer's except the content of what each dealer was selling. I would try my best to save my money until the last day, but there's already items I wanted to get. The Rem plushie from Re:Zero is already catching my eye. 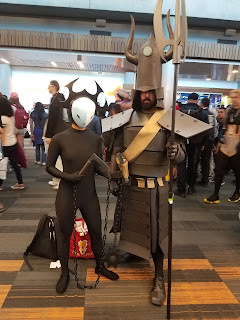 We would leave and would roam across the hallway to Artist's Alley where we would see right outside the Alley was a table for Krakencon and Hydra Comic Con that I am planning to attend next after Fanime. I would take a quick glimpse as they were promoting the new Hydra comic con from the organizers who made Krakencon. They have already announced big names including Johnny Cruz who voiced Lucio from Overwatch, Keith Silverstein who also voices in Overwatch as Torbjorn, Rob Paulsen the legendary voice actor who voiced in many cartoons such as Animaniacs and Teenage Mutant Ninja Turtles, And Catherine Taber who recently is voicing Lori Loud from my favorite cartoon series right now, The Loud House. No doubt it's already starting to look great for a first time con and I can't wait to attend Hydra after Fanime! Ok back to Fanime, me and my friend would hit up Artist Alley and would browse around every artist to see what they've been working on recently. And what I would already see was that there was just so many artwork from each artist that were up to date with the latest hit anime or video game series. Many of the artists were drawing Pokemon Sun and Moon fanart, which we greatly appreciated since we are both cosplaying from the series. Persona 5 was a hit to all the artists, like almost every one of them would have their own fanart of the characters and they all look great! My Hero Academia was also hot off the artist's alley, every piece I saw looked amazing as well. And then there was Your Name fanart as well. As much as it hurts to see the film, the artwork that the artists here at Fanime drew also hit me hard too. Eventually I did plan to buy an artwork from Your Name later on during con. The artists overall definitely deserved to be here again as their artwork really appealed to me. The odd thing about artist alley was the amount of empty tables. Were they occupied or reserved for an artist that wasn't there yet? Unfortunately no. So can an artist that want to sign up at con get the table? That I have to find out myself. Actually a friend of mine wanted to do that at this year's con but to no avail for him. So really though what is with the empty tables? When we left Artist's alley was when both Artist's and Dealer's was about to close and it was about time for us to grab a bite of dinner. I would meet up with a couple of friends as we would hit the SoFA market on 1st street. My friends would grab foods from different restaurants in the market. One would have pizza at Pizzetta 408 which opened up this year, One would grab a vita bowl from Vitama Juices and Blends, and I would get a burger from on the Flipside. All of them are great eateries all in the SoFA market that Fanime attendees would grab food at besides the dirty dogs. A good meal to have for the night. Then we all would hit up the Swap Meet again. Yes, Swap Meet is two days at Fanimecon and this time we are not sellers anymore, we are buyers this time. We would arrive around 9pm since this time around, Swap Meet closes later at 1am. We would browse all around to each of the sellers as they all had goodies that they were going to sell off, most of them from their collections. Overall, the whole South Hall of Swap Meet is huge. The amount of Swap Meet sellers was overwhelming, it filled up 4 rows of sellers from the entrance to only half of the South hall, which in length can be compared to 1/4 of the overall length of Fanimecon. That's pretty huge! It would take us hours to search through all sellers and go back to some of them to buy from. 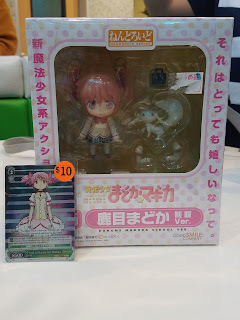 I would end up getting a Madoka Kaname nendoroid figure from Madoka Magica as well as a SR Weiss Schwarz card of Madoka to complete a "puzzle" in the set. I also did pick up a couple of Re:Zero card sleeves and a card box of the same series. It's odd I thought I would buy more but good news for my wallet. It was around 1am that I would head back to the convention center where I would hang with friends in the gaming room and visit their hotel rooms as well for the rest of the night. Coverage ends here for Day 1. But overall, it's was a pretty chill day. Nothing too big to report, we looked at Dealer's, Artist's, and Swap Meet and they're all been looking good so far. It isn't until these next days of con that the excitement begins! Another late night meant me waking up a little bit later than usual. 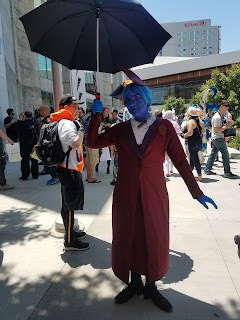 Day 2 is usually the most busiest day of con and everyone would bring out the best cosplays for this day. For me, I was a part of a group for the show, My Hero Academia, and I would cosplay Midoriya Izuku (Deku) from the show. 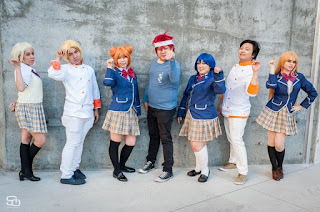 This group I've been cosplaying with for years and every year, we always wanted to a cosplay altogether. Last year, we were cosplay Eeveelutions from Pokemon. This year, we're all heroes from U.A. High, Class 1. 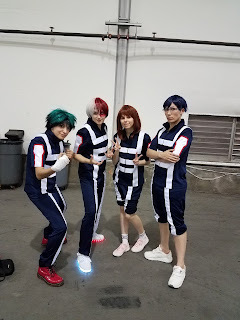 We first had our group that included an Ochako, Bakugo, Todoroki, and Tsuyu. 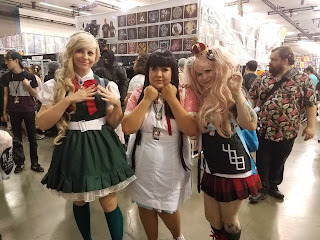 But we did also meet up with other friends who were cosplaying the same show as us and also wanted to join in as well! 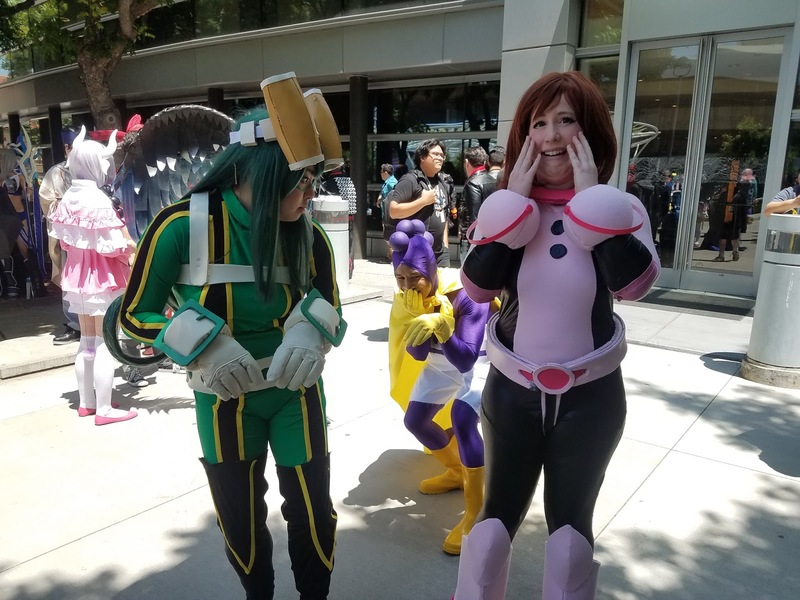 We included an Aizawa, Kirishima, and Mineta into our group as well. 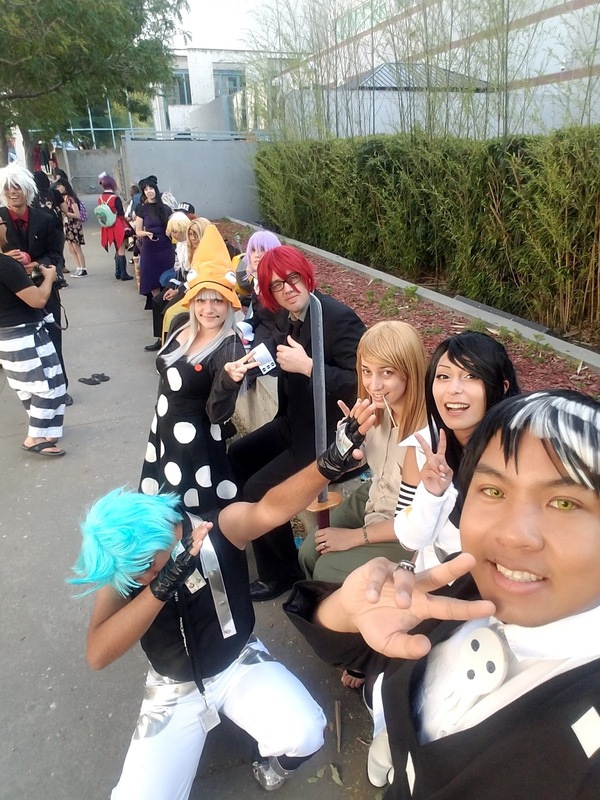 We would all be out as the whole group around noon and would be around the photogs corner (left side of Fanime entrance on Marriott Side) waiting for our photographer for a photoshoot. But in the meantime, we would be stopped for photos and lunch. I would pick up one of the dirty dogs that they were selling outside of the con center since we were limited in time. I keep on forgetting how good they are and even if it's for $5, it's food and I needed it at the moment. We would meet with two of our photographers, one we had for like a couple of minutes and took pictures of our whole group inside the convention center right in the bottom of the new building. There is apparently a patio-like stairwell that connects the sidewalk to the bottom floor of the new building where most panels and viewing rooms are located. This patio is blocked off by a gate but can be accessed by going inside the convention center. Apparently this area is where many cosplayers would take photos with their photos. So we took our photos there, just a group shot of all of us in a stairwell. 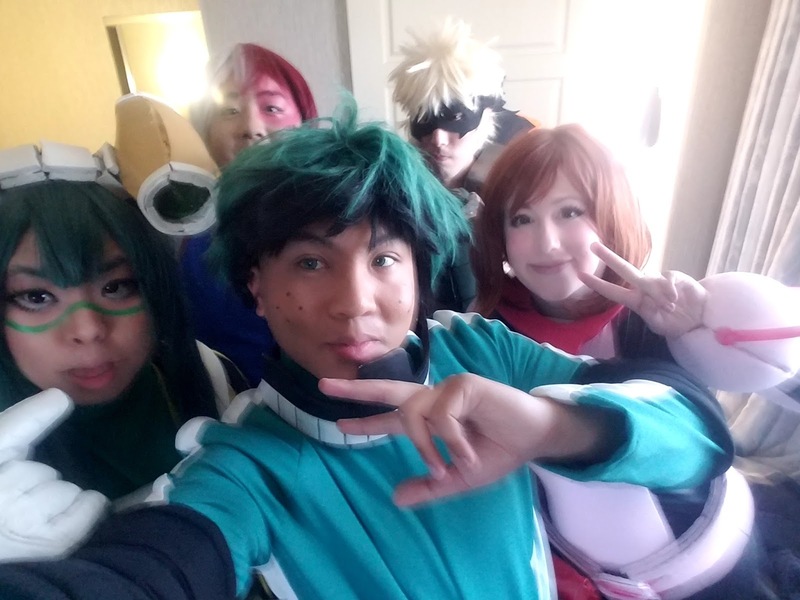 Why does Kacchan have to ruin a photo? 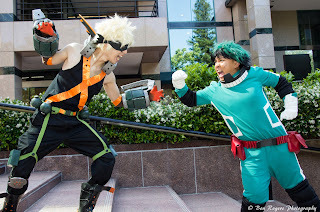 Kacchan v.s. 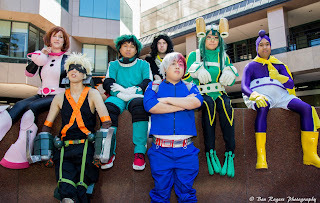 Deku. Yeah we totally hate each other. You can see more of our photoshoot on Ben Rogers Photography page on Facebook. 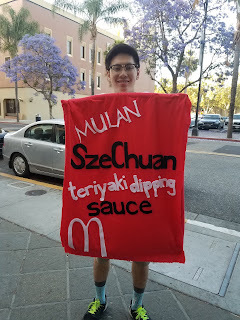 Now it was around 4pm where me and my roommates would change out of our costumes. Me and Justin would hit up a pool party in the Fairmont to relax from our cosplays and chat up with friends in the party since I haven't met them in so long. We would be there for like an hour before we had to go to a restaurant called Sai By Thai and celebrated one of our friend's birthday that he was celebrating this weekend. The thai food was needed though, it was good food close to the convention. 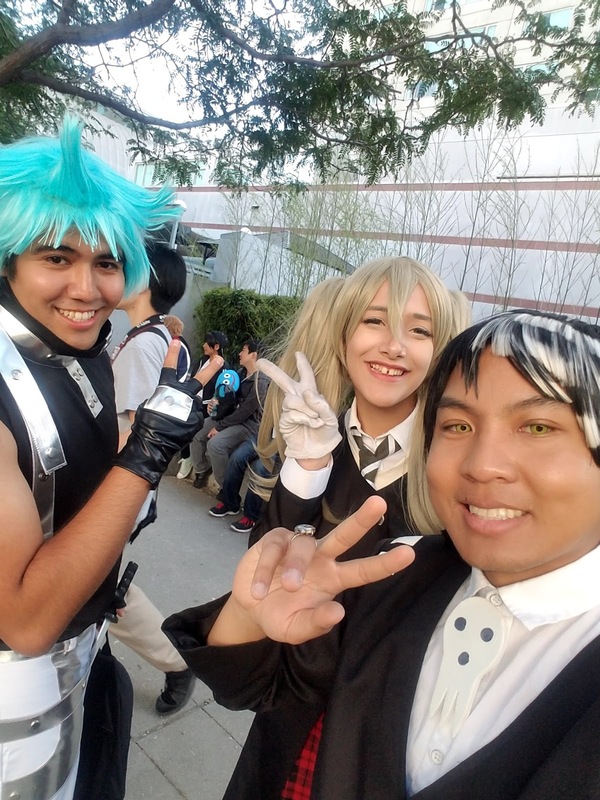 I would walk back to the con to hang with a couple of friends around the convention just catching up and all since I haven't seen them since the last Fanime. 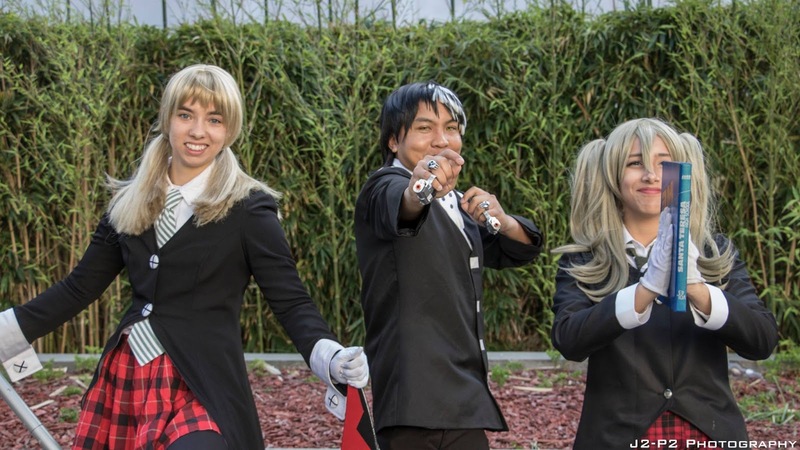 But when midnight hit, I would hit up the Persona Midnight gathering and check out the awesome cosplays out there. But what I would see when I went to the gathering was the Persona 5 gathering. Literally, almost everyone was cosplay from the hit PS4 game and although I wasn't cosplaying for this gathering, I was wondering where's the representations of the other Persona games?? I would only be able to see a couple of cosplayers cosplaying Persona 3, Persona 4, and Persona 4 dance all night but the rest of them were all cosplaying characters from Persona 5. I would see many protags, Ryuji, Ann, Makoto, Yusuke, Futaba, Haru, Goro, and even people who cosplayed Morgana the cat. 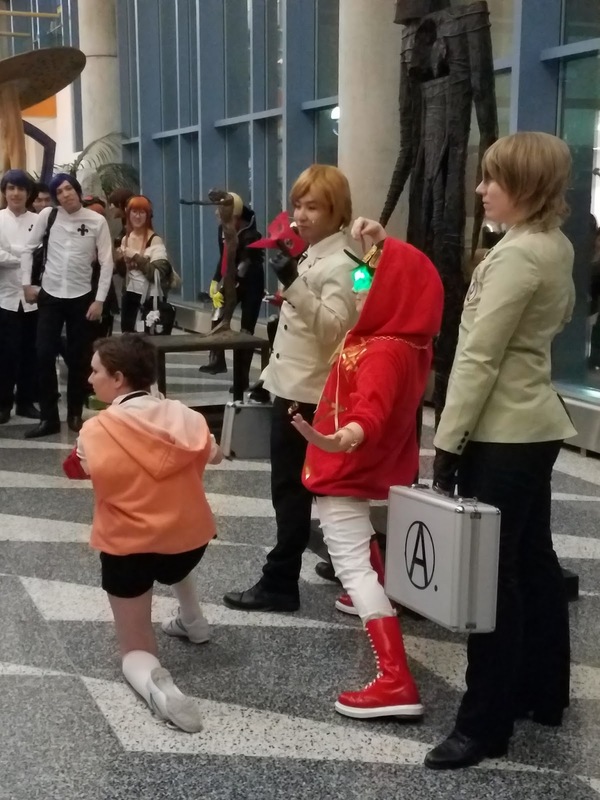 There was even people cosplaying characters that you social link with like the teacher, Sadayo, the medicine dealer, Tae, even Shinya the random kid you meet in the game. 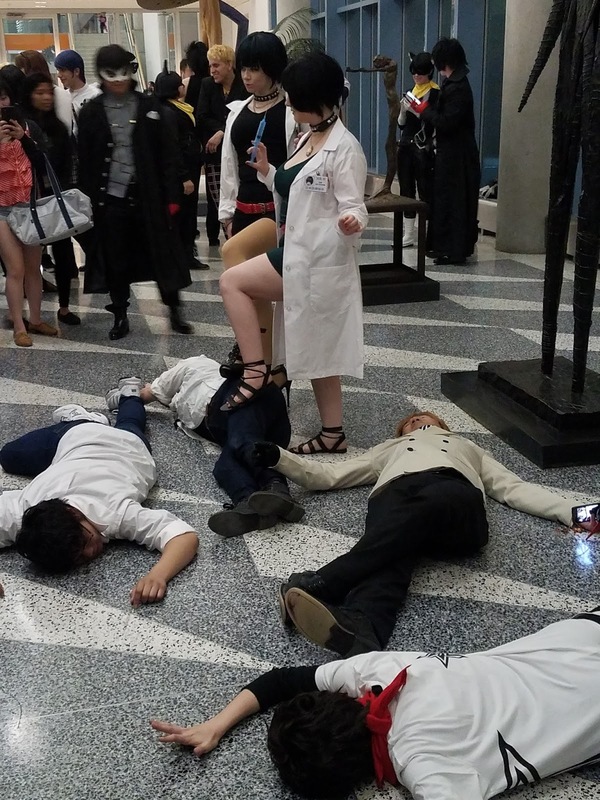 So this "Persona " gathering was really just the Persona 5 gathering. 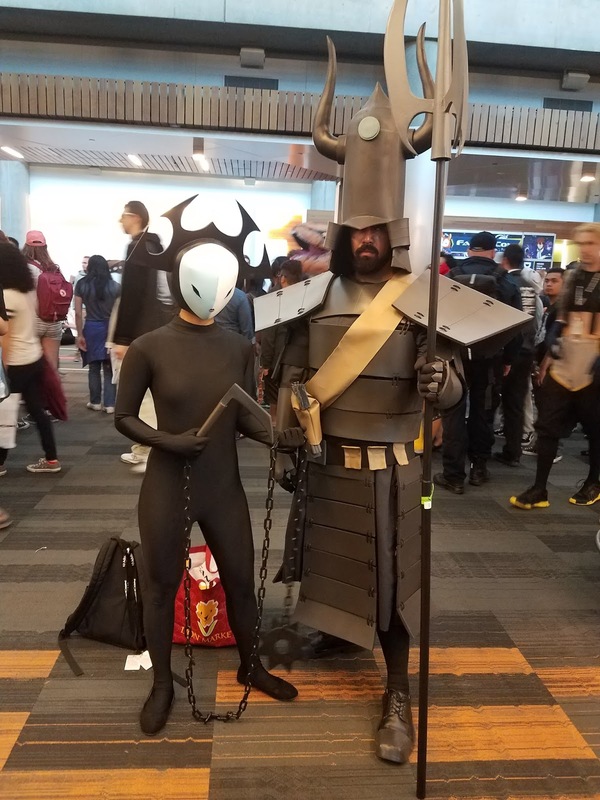 Although I did like the presence that many fans are moving on to cosplay P5, it would still be kewl if we have some representation of the old games though. I guess everyone's just moving on. 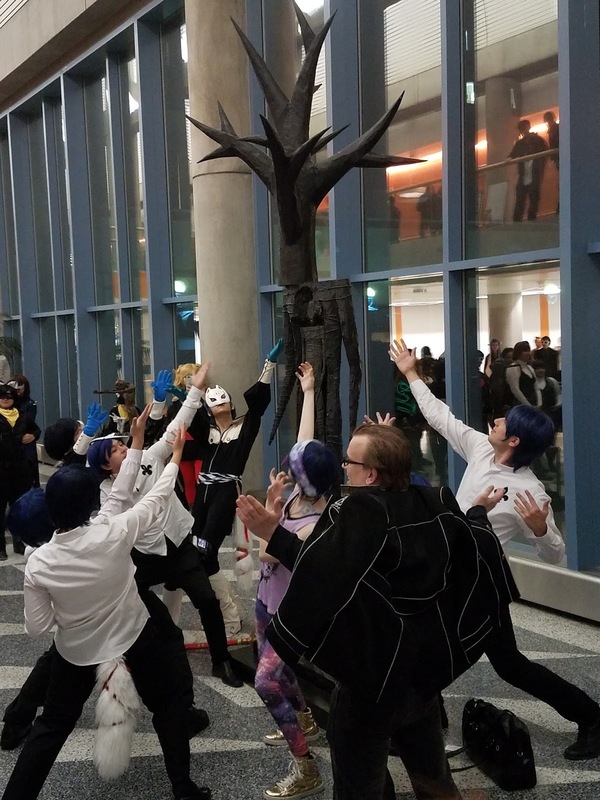 The Emperors are praising a tree? 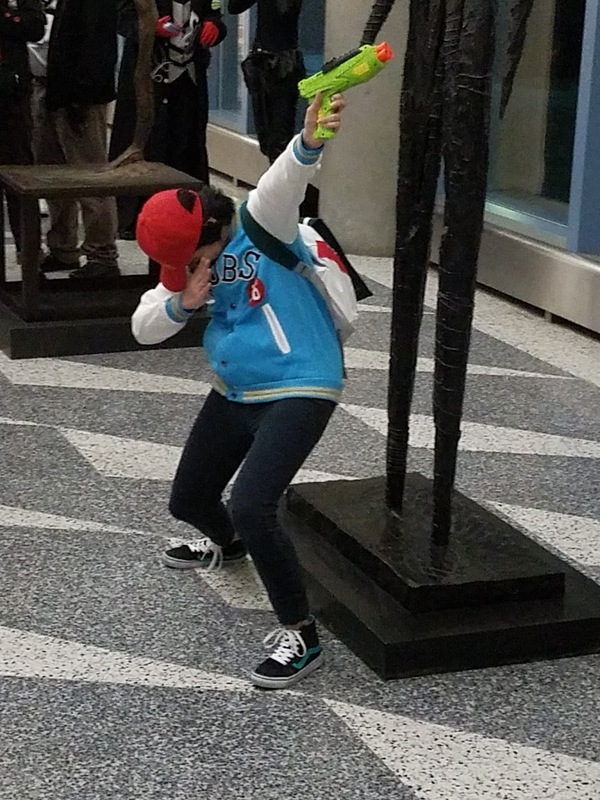 Shinya be dabbing on the gathering! The gathering would last till 1am and I would hang with a couple of people from the gathering and would try to grab something to eat. But since it's past midnight, nothing really much was open except Jack in the Box, La Vic's, and 1st street late night eateries but they are always packed since clubs open up this night and they usually have those club attendees going to these places for after party snackage. We would end up not getting any food and just pretty much calling it a night. 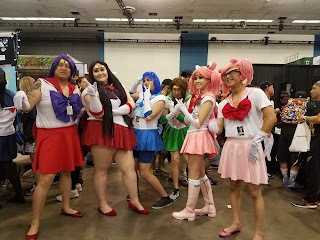 But it was an awesome day cosplaying with my friends! 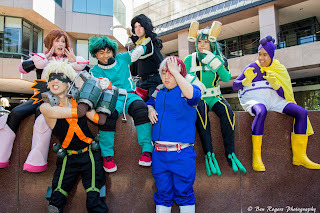 Our My Hero Academia group turned out to be awesome and just the fact that hanging out with old friends that you haven't seen in quite a while is always fun to do. Another busy is planned up for tomorrow and I hope for the same excitement as today! 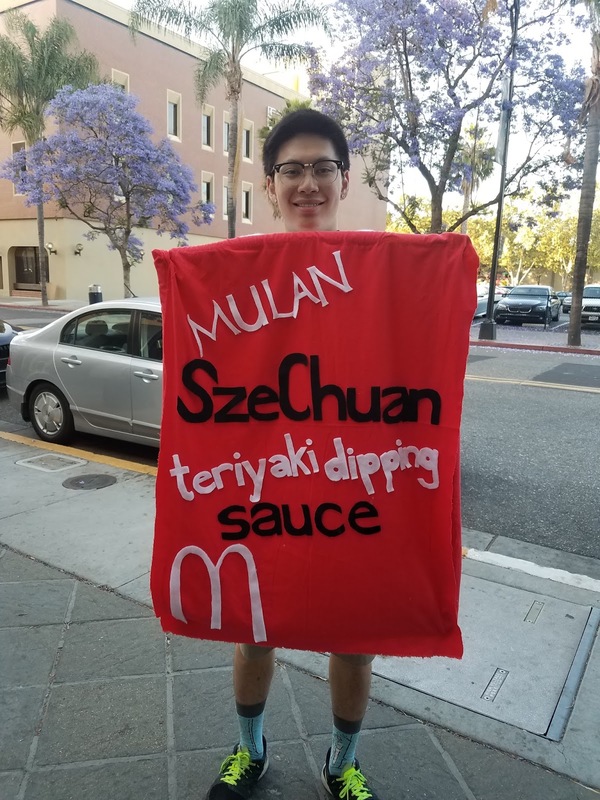 I need that Szechuan Dipping Sauce, Morty!!! With an early sleep comes me waking up pretty early to get ready for today's next cosplay. 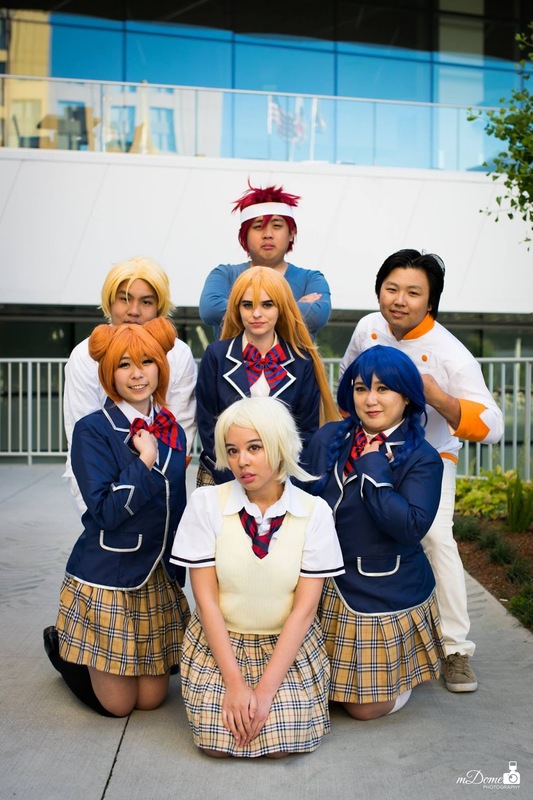 And this was actually pretty historic for me since this cosplay I have not worn for so long. 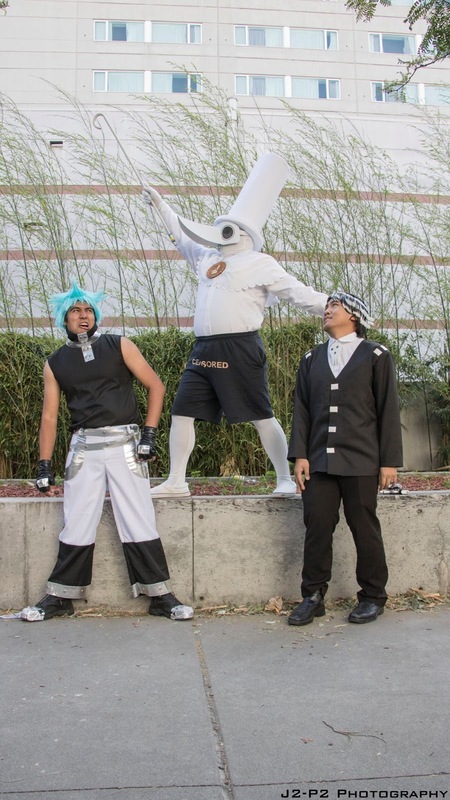 It wasn't until my friend was going to cosplay from the show and they wanted me to be a part of it as well. I gladly accepted and went through my closet to know it's still good to go, Yup, Kid is back. 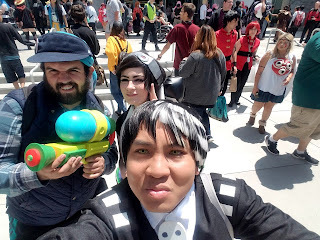 Today's cosplay was Death the Kid from Soul Eater. The last time I wore this would be back in San Francisco during Cherry Blossom Festival and that 3 years ago! Who knew I would still fit in well with my old cosplays! I did upgrade the old cosplay by redoing the wig and adding on yellow contacts. This time your seeing another kind of Kid today! I would meet up with my friend and the whole Soul Eater group we had and we pretty much had almost everyone. There was my friend and her boyfriend who was Tsubaki and Blackstar and also their friends who also cosplayed from the show. Now I only know my friend and her boyfriend but I would hang out with the crew for most of the day. It was a good time for me to socialize and make new friends and these people were awesome to hang with. We talked about animes, video games, cons, etc. you know the normal talk and I would definitely feel the friendship amongst these great people! We would go out to Gong Cha to grab some boba since it was pretty hot in our cosplays. How great that I just meet up with these awesome people and now we're great friends! The Meisters of DWMA on a selfie! 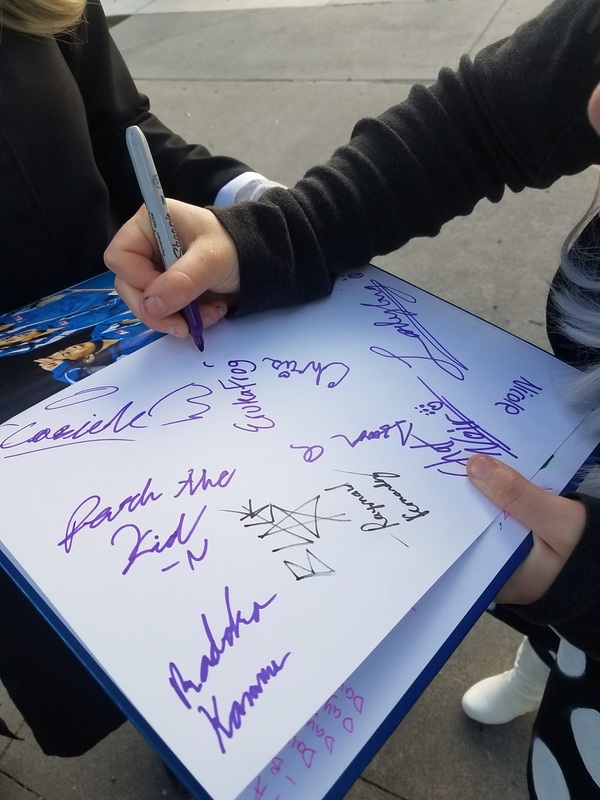 One Maka cosplayer brought her yearbook for all the Soul Eater cosplayers at the gathering to sign! 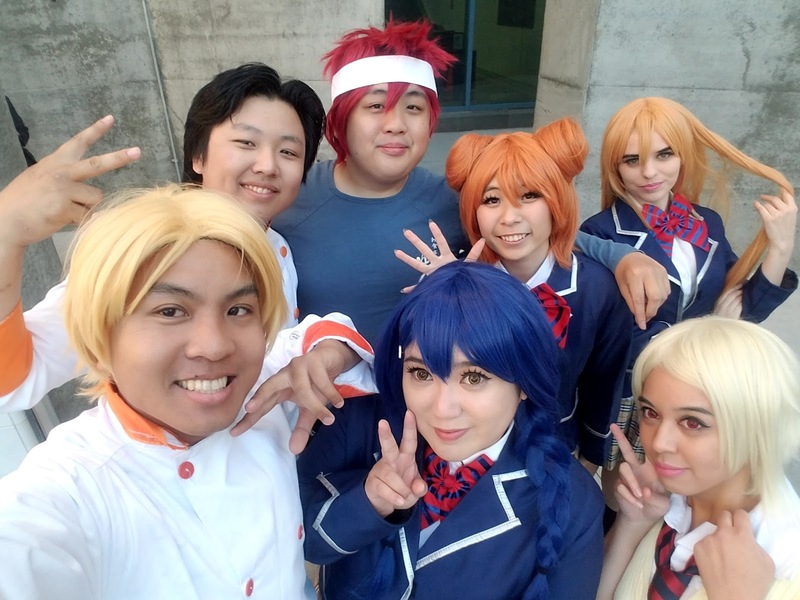 After the gathering, I would split off with the group and head back to the hotel but I also would meet up with Fire Emblem cosplayers on the other side of the new building of the SJCC and got to meet up with them and take selfies. 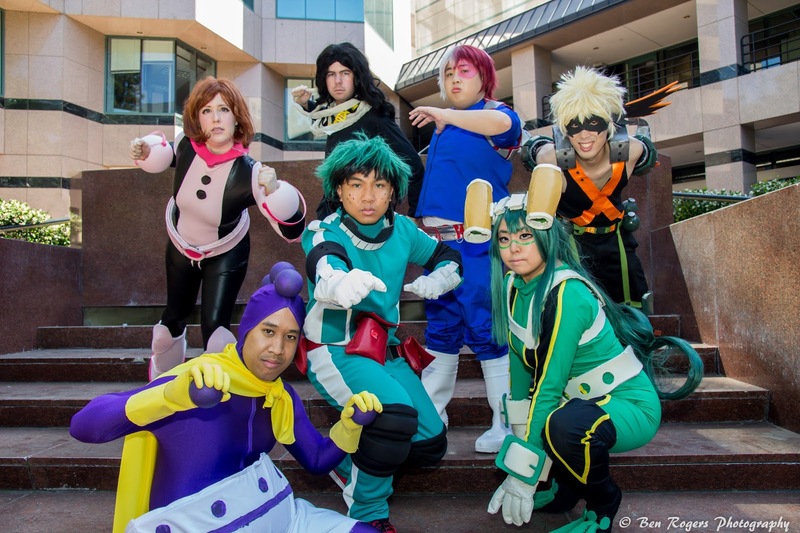 The event was almost filled up as they were able to get the main panels room of Fanime to hold Fanimania IV. 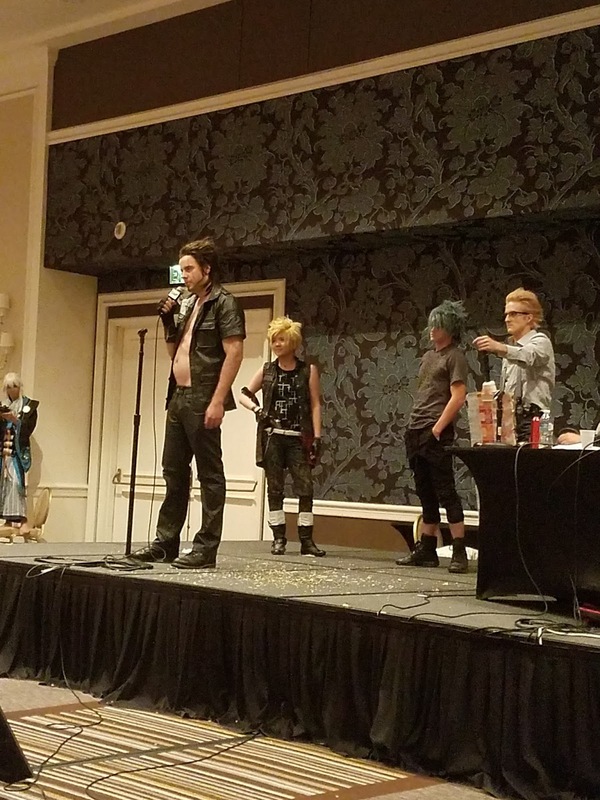 There were many new characters that wanted to take their chances in getting the belt (for example: A Wrestling Pikachu, your Waifu pillow, and Gladio from FFXV) and some came back to try and redeem the belt that was taken from them. 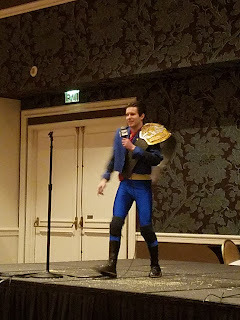 Some notable things that happened during Fanimania IV was that Wendel (People's Champ) may have participated in his last Fanimania, Reality would not be at this event but left a very grim message for his opponents, and the return of Dio from Jojo's Bizarre Adventure who was the first winner of Fanimania! Another thing I've heard from the CWF is that they are now being sponsored! A company called All Pro Wrestling has provided CWF with many of the equipment including the microphones! 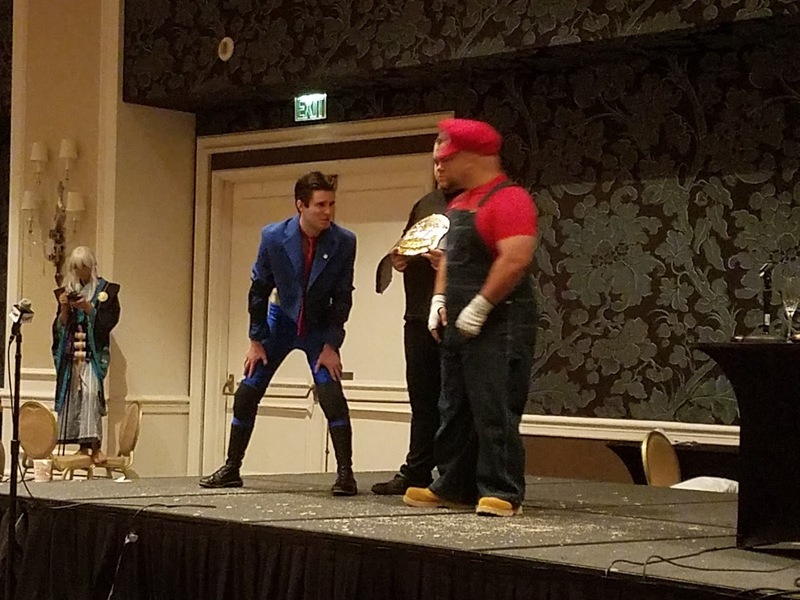 It was an entertaining first round as we were able to see over 10 attendees compete in this CWF event only to have 6 of them compete against the champion, Phoenix Wright. They are Gladio, Princess Lela, Super Mario, Onii-Chan, Jotaro, and Star Lord. And with the 2nd round with all of them giving off their word to the champion, only one could go on to face off with Phoenix Wright and that would be Super Mario. Now throughout his run in the CWF, he has never won a CWF main event. Would this be the time that he will retain the title of CWF champion??? As the two have exchanged words to fight each other, one would have the slight disadvantage. As Phoenix tries his best to better his Nintendo foe, a lot of "What's?" came out of the crowd. Was he mistaking his speeches? No Objection? 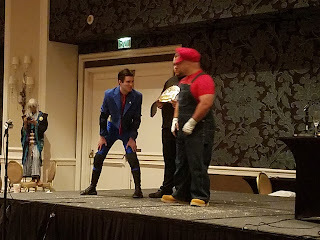 The winner was pretty clear as Lashayda would split the two apart and announced the NEW champion of CWF, Super Mario!!!! Afterwards, G (who was cosplaying Hiki) would get out of his to announce what has been happenign with the CWF and it has all be positive. On it's 4th show in Fanime, it has now gotten the biggest panel room to host it in. The crowd has always been excited and this year's was as much as exciting as the other Fanimania's. Plus the addition of a sponsorship with APW, the whole program is going up. From Hiki: "Whoever didn't come tonight made the biggest mistake of their life!" And I would agree, this show is always amazing to see and is always hype! Can't wait for it's 5th anniversary next year! 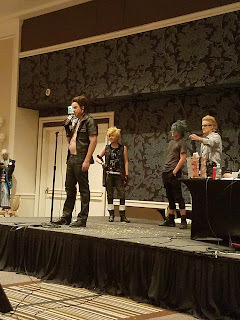 After the panel, the crowd would interact with the participants of Fanimania IV. 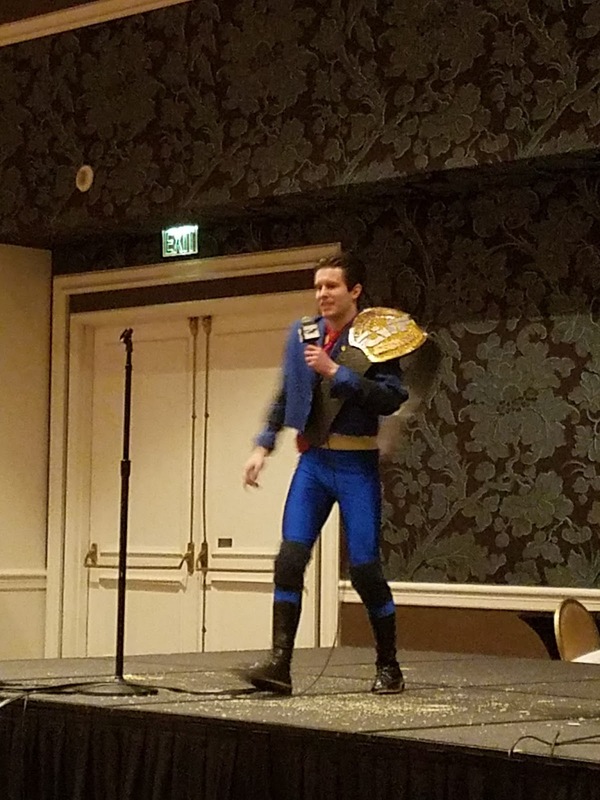 Phoenix Wright is the current CWF champion. Can he keep the title tonight? After the show, I would head back to my room and drop off my stuff for the night and since this is the last night out here at Fanime, it's time to party. I would end up hanging with a couple of friends getting drinks around as well as go to a couple of hotel parties and getting drinks there too. We would all eventually end up going to the gaming room where I would meet up with everyone and play a couple of arcade games. And then from a distance we would see a couple of people we assumed we thought they looked like. They were playing the terminator arcade game when we pass by them and we actually were right that we saw members of X4 just roaming around the gaming hall and no one noticed but us! We would meet up with them and we had to take that selfie! I would chill in the gaming room for a while until around 2-3AM where I would call it a night. 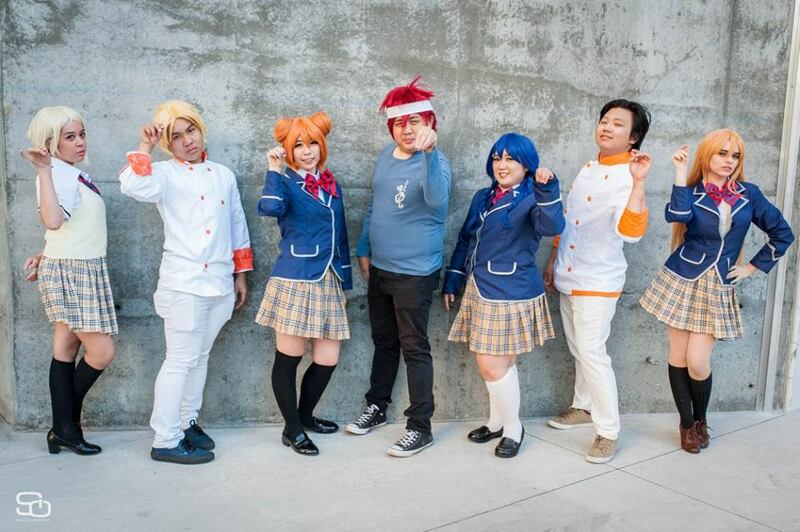 But as the last night of Fanime ends, this was a day that was really exciting. The final day of Fanimecon is here and the first thing that we have to do is what we always do when the last day comes: Pack up everything. After a morning shower, I would get all my stuff from my cosplays, food, necessities, the Switch, etc. from what I brought over to the hotel room and then pack it all up in my luggage. Then I would go into my cosplay for the day. It's a new cosplay that I've been wanting to cosplay from since the show premiered last year but most of the characters are girls. But when they debuted a genderbent episode, It was an opportunity for me to cosplay it now! I would cosplay Lars Loud (Lucy Loud's male version) from The Loud House. Being as it is a fairly new show, I wouldn't expect much people to know about the show but it was something I've been wanting to do and since my friend was down to do Lars' roommate, Lynn, I went for it. 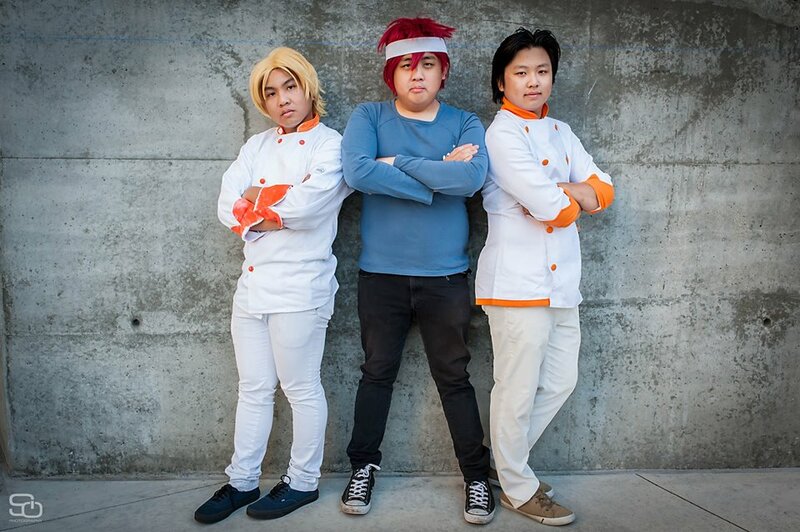 We would all be packed up and my last time with these roommates for this Fanime. But we know each other a lot though so I would not expect to have some significant changes with roommates for next year but we'll see. I do have to take one more selfie with these guys. I would store my luggage away with the hotel's luggage room and would meet up with my friend and we would be cosplaying from The Loud House throughout this last day of con. Lars and Lynn Loud in the house! Throughout the whole final day of con, me and my friend would just roam around the Dealer's Hall and Artist's alley just getting whatever we can before the con closes. 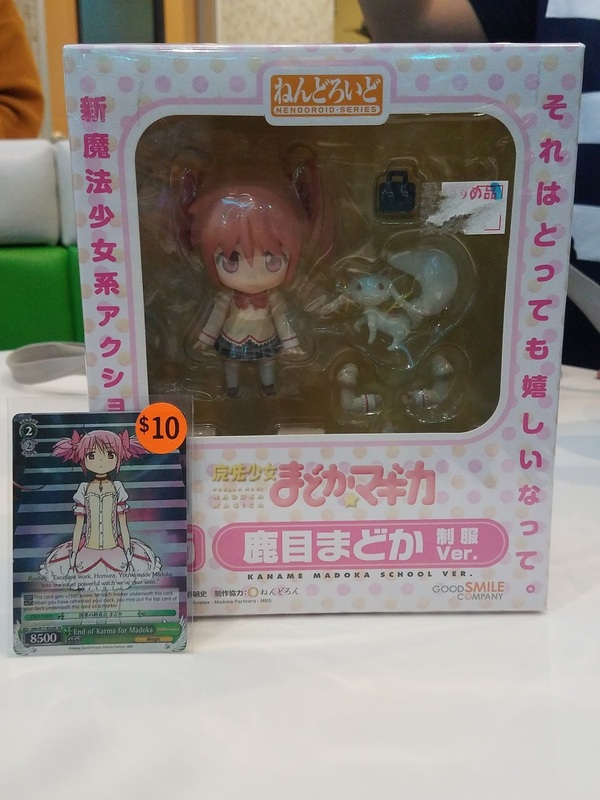 We would hit up Dealer's Hall first where I would get only a couple of things that I missed out on getting when I was roaming during the first day which included a Rem plushie from Re:Zero, A Nico Yazawa figma from Love Live! School Idol Project, a figure building box with the first years of Aqours from Love Live! Sunshine, and Vol. 4 of the illustration book from the Love Live! School Idol Festival game. Which looking back at it, I bought alot of Love Live! stuff, don't ask. And then me and my friend would head to the artists alley for one last look at all the artists work in there as well. I would buy some notable artwork that would be on my wall later on. From all the artists I would purchase from, I would also grab their cards as well just in case I need to ask them for commissions since their artwork looked worthy to me. But after that, my friend would have to leave since his ride was about to go as well. I would meet up with a couple of my friends outside of the con since it was now time to close the con up for the year. As all the attendees leave the SJCC, we would be relaxing in the grass steps on the right side of the convention center for a while until we were ready to go. The con is now over and now starts the after con part of this report. We all never had lunch yet so we decided to grab a bite to eat at Pizza My Heart to fufill our hunger. This place would be packed with attendees of Fanime throughout the weekend that we just avoided this area for most of the con. It wasn't until today that we saw a significant decrease in Fanime attendees going for food since we left the con grounds around 3pm when the con would officially close and that most of the attendees would leave Fanime for home or for someplace around to hang out before everyone leaves till next Fanime. For us, we decided to have a chill lunch to eat around San Jose. 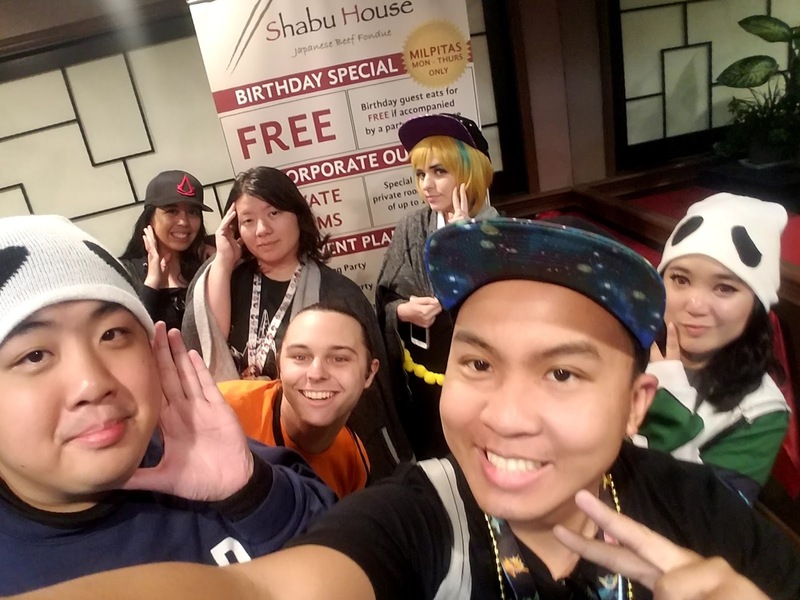 Afterwards, we would roam around the con one last time and see if there is anyone around to say goodbye to and then head out to a Shabu place one town over in Milpitas for an all you can eat dinner. The dinner was a great way to cap off a great weekend at Fanime where we can order all the meat we can eat and of course socialize for one last time until the next con or hangout. After the dinner, we would all split our separate ways as Fanimecon has officially ended for all of us now. Until we meet again, fam! Well the first thing that I was would notice is the registration. It was last year that it went wrong again, that attendees had to wait at least two hours to get through registration to get their badges. With the move back to the hub in the SJCC where it originated, my thoughts were that it would have a significant change in registration. Well it definitely did for the better. There was a whole bunch of people lining up that stretched all the way outside of the Hilton hotel and when registration opened, everyone was able to get their badges really quick. When we arrived in our spot in line, it would take us 30 minutes to get through registration. 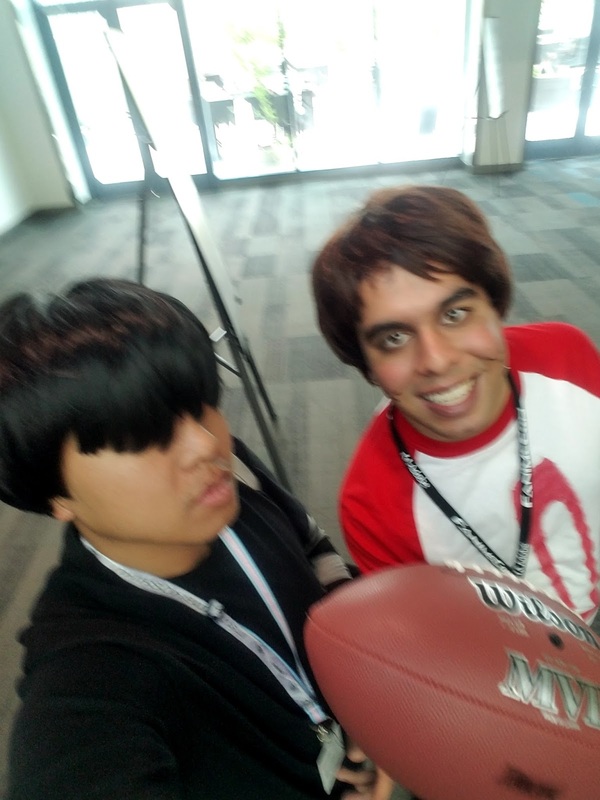 What I saw in registration this year was something out of Anime Expo's book. They have many tables with computers and scanners and all attendees would do is scan the barcode they had when they pre-registered for Fanime and then get their badge in a minute. Then head to the table to get your Fanime bag and then head out of there. It was just a smooth process this year and that was just a big improvement for registration this year! After all the criticism with registration being a pain througout Fanime's history, there were times that were significantly long and some that were just instant. For now, they have found their solution for registration and hope it continues on for year's to come. This Fanime, I've done new things around the con especially attending my first Swap Meet selling out there and making significant money back from it. The reason is that Fanime has always had a lot of attendees and selling at Fanime was something that I wanted to do. 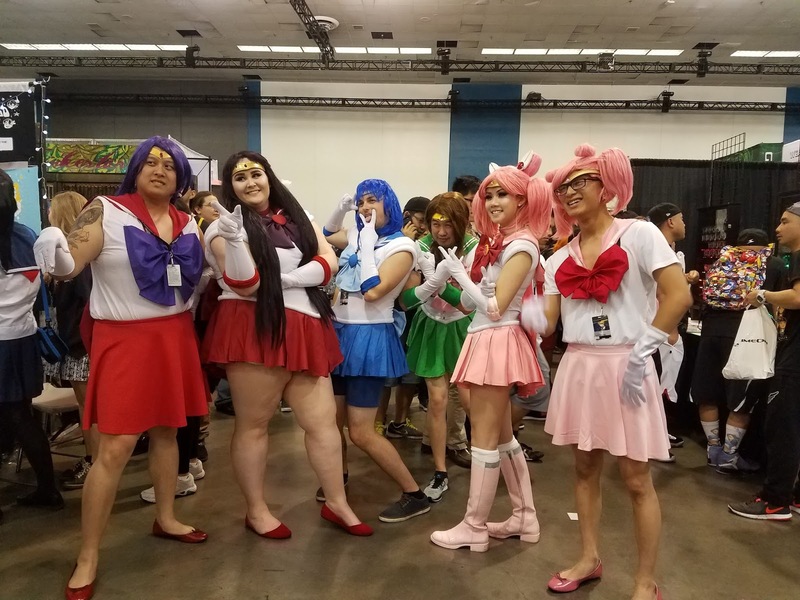 I mean Sacanime was ok to say, they have their attendees and it's not as big as Fanime. 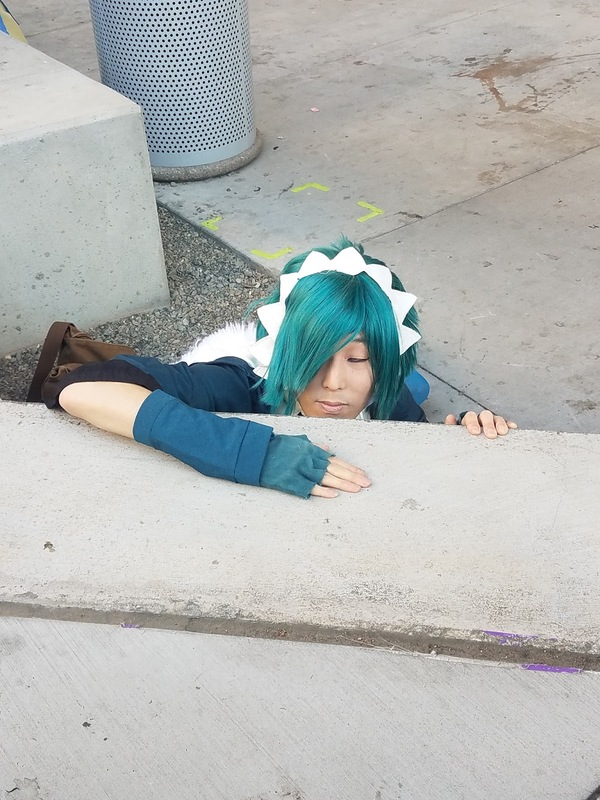 So I wanted to see how selling at Fanime works and it turned out to be non-stop asking questions and helping attendees out with what they want. I remember that I could not really talk to my friends during the first couple of hours during Swap Meet since there was just so many attendees looking at what I was selling and of course selling it off at a good buck so that we can make a sale. The swap meet was very overwhelming, much more than Sacanime and definitely would like to do it again. It was actually really fun to see this event in a sellers perspective and no doubt the fun makes me want to go back again, hopefully to make more money. 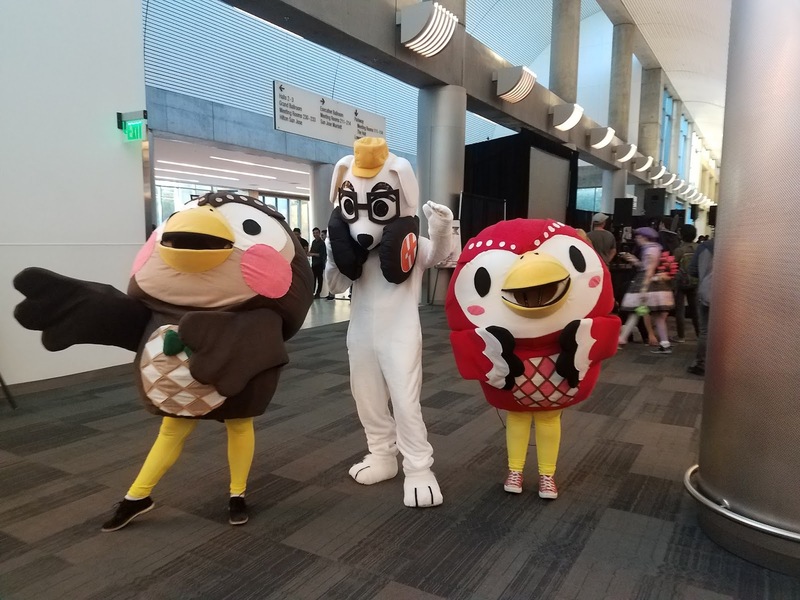 Overall this Fanime was mostly chill, nothing really significant out of this Fanime but just hanging out with friends, debuting cosplays, cosplaying with friends, and attending panels of the sort. There was not really any changes that happened during the con that I have to point out, Dealer's Hall and Artist's alley was running fine even if both had the same layout as last year's Fanime. Nothing really big to point out this time around. I must say, this Fanime had no problems! I'm not gonna lie here, but I thought this year's Fanime was one of the best. Even if I wasn't really active at Fanime this year, I still managed to have a good time. I wasn't really bored or didn't do anything for a siginficant time, I felt there was a whole lot more to do this year and it got me busy all around Fanime which is good. You don't really want to get bored at a con like Fanime. 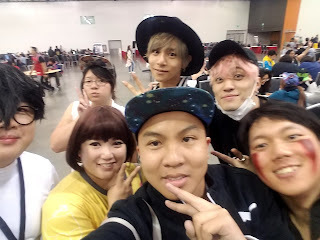 So yeah, Fanime 2017 would have to be a Fanime that is one of the top for me and I just hope they keep the same format for this year's Fanime in the next one. And that's it! Fanime 2017 is done and I'm on to the next one. Up next for me is Hydra Comic Con in the Santa Clara Convention Center. The last time I attended a con here would be AOD 2016 so I'm glad to hear I'll be back for Hydra. This con is a new one made by the makers of Krakencon to have themselves their own comic con up here in the bay area. A lot of special guests have been announced especially from Overwatch, Johnny Cruz (Lucio) and Keith Silverman (Torbjorn) and also cartoon voice actors like legend Rob Paulsen (Animaniacs, TMNT) and Catherine Taber (The Loud House). Looking forward to this one for sure. But for now, we leave off San Jose and Fanimecon for the year. Until next time!! !